Electric Consumer accepts limited advertising. Contact American MainStreet Publications at 800-626-1181 or amp.coop. 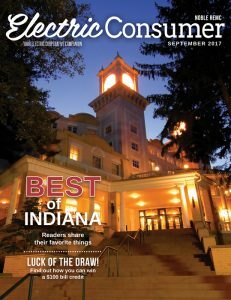 The Electric Consumer strives to provide readers with information on rural electric issues and energy, as well as features on members and Indiana pastimes. Popular features include a reader-generated recipe section, a gardening column, an energy column, and a statewide events listing.